When and how you embrace artificial intelligence will shape the future of your business. Do we risk being eclipsed by competitors who understand AI’s possibilities better than we do? Can competitors adapt more effectively to the digital revolution than we can? Where are the points of leverage in our business? Where do we begin? AI is gathering steam, and it’s the right time to confess your ignorance and start asking these questions. Many companies have already supplemented their operations with virtual assistants that compose eerily human emails to schedule meetings. On a more strategic level, the recommendation engines that have helped propel Netflix and Amazon to the peaks of capitalist glory are becoming available to existing firms. What do you need to know? And what opportunities does AI offer you? We have scoped the current and near-future state of AI, and offer our findings to non-technical leaders and managers to develop the confidence to move forward. The essential finding: even in these early days of AI, your business should be looking for opportunities at the core and at the edge. Breakthroughs here require labouring through a sequence of options. A machine learning toolbox built into the experimental setup can look at experiment results and algorithmically decide which experiment to do next, and even deduce the general outcome of a series of experiments. Machine learning algorithms have shown promise in disease diagnosis (for example, early detection of breast cancer). Machine learning can also be used to understand risk factors for disease in large populations. For example, Medecision identified eight variables to predict avoidable hospitalizations in diabetes patients. 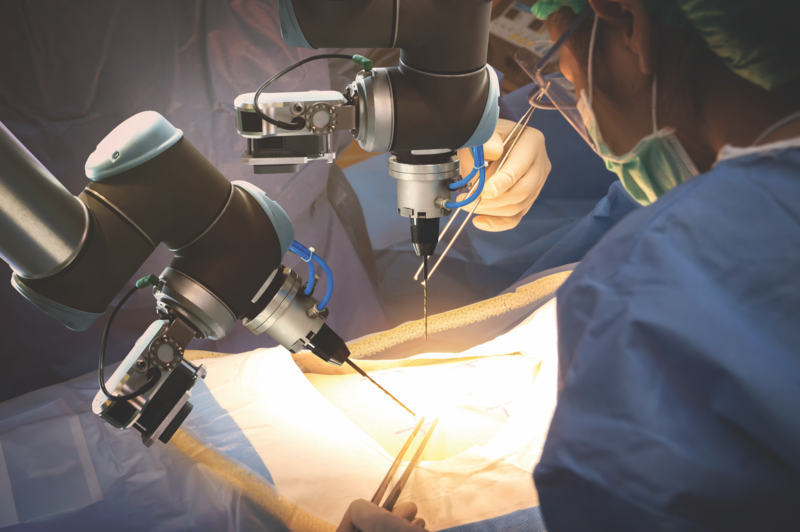 AI software outperformed pathologists when predicting overall survival in patients with brain cancer. It is predicted that by 2020, more than 85% of all customer support communications will be conducted without engaging any customer service representatives. This is a high potential field. PayPal, for example, is using machine learning to fight money laundering. Its AI tools can precisely distinguish legitimate from fraudulent transactions. Smart cars will likely be roadworthy by 2025. Fully integrated into the Internet of Things, the smart car will learn about its owner and its environment (adjusting temperature, audio, seat position automatically), report – and even fix – problems, drive itself, and offer real-time advice about traffic and road conditions. Intelligence in logistics and shipping has become centre-stage within supply chain management. Faster and more accurate shipping reduces lead times and expenses, adds environmentally friendly elements, reduces labour costs, and widens the gap between competitors. If autonomous vehicles are developed to their full potential, logistics optimization for the supply-chain industry would be astronomical: a driverless truck can drive nearly 24 hours a day, doubling the output of the US transportation network at 25% of the cost. How can AI support your business? Even if you are not in the tech business, AI can be used at the core of your business to help to drive it, or at the edge simply to make it easier to do business. If AI were a cruise ship, improvements at the core would move it faster in the right direction, while improvements at the edge might make the deck less slippery. 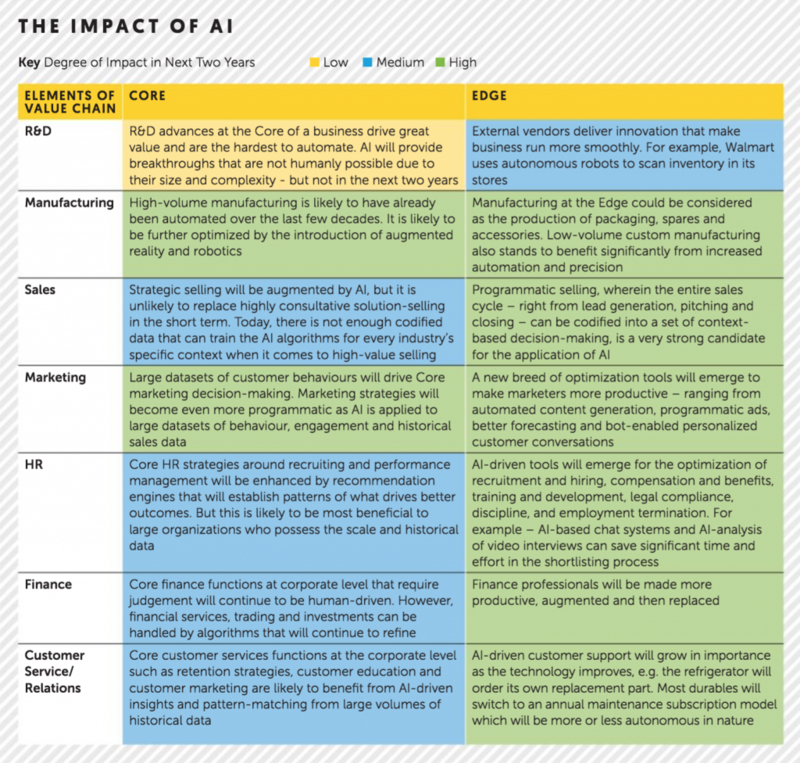 AI at the core aligns the business more strongly with market fundamentals because it can better inform the vital decisions around what to produce, for whom and how to get it there. AI does this by mashing up large data sets from macro variables, field data, inventory data and, as we all now know, from sources like Cambridge Analytica and social media data. The heuristics resemble the meteorological models that forecast weather from large datasets consisting of weather signals and ocean currents. In financial services, AI has enabled core activities such as automated equity trading, fraud detection and data security. In pharmaceuticals, AI is helping to develop devices, find new therapeutic targets, design drugs and more. AI at the edge can enhance almost all functions in a business and save time and energy for more value-added work. Imagine, for example, the productivity of a field sales rep whose mobile Alexa handles all the CRM administrivia through simple and easy voice commands. AI is increasingly being used in recruiting, predictive maintenance and improving customer support service quality. According to estimates based on the work that IBM Watson labs has done with its customers, businesses can reduce customer service costs up to 30% by implementing conversational solutions like virtual agents and chatbots. Given the low cost of creating an AI-enabled app today, thousands of tech startups are picking niches, creating apps for our work and personal lives. These apps promise to save our time, costs or help us make smarter decisions. In the table above we have identified current and potential AI uses in the value chain. Today, almost all applications of AI are based on machine learning, but moving towards the more sophisticated model of deep learning. Commercial technology is still a long stretch away from truly autonomous self-learning, where you introduce an AI agent into the stream of business-as-usual and AI develops its own models. When that happens, we will be closer to singularity, when AI meets or exceeds the intelligence of an adult human. But the point is that AI is here now, and more is coming. Whether it helps or hurts your business is largely up to you and your willingness to get your organization to take on the challenge. The earlier you engage, the better placed you will be when the inevitable next wave of sophistication arrives. — Mohit Garg is co-founder and chief executive of Proxce, a technology platform that enables Internet-of-Things devices. Kate Sweetman is founding principal and chief client officer of the SweetmanCragun Group. Speech Recognition Microsoft has demonstrated speech software that transcribes spoken words into English text with an error rate of 7%, translates the English into Chinese-language text, and then simulates the English speaker’s voice uttering them in Mandarin. Google used deep learning to cut further the error rate on speech recognition in its latest Android mobile software. Machine Vision Google’s deep-learning system, shown 10 million images from YouTube videos of the entire world of cats, proved almost twice as good as any previous image recognition effort at identifying cats as cats. Facial Recognition Google (FaceNet) and Facebook (DeepFace) for facial recognition. Apple’s Emotient to read faces for emotion. Online Search and Tracking Web searches, online questionnaires, customer feedback forms – they all help gather information about the market, customers and future business prospects. Websites that ‘remember’ you, visit-to-visit and device-to-device and curate relevant content for you personally. Recommendation Engines Netflix, Amazon and Pandora all use AI to determine which movies to recommend, products to highlight and songs to play. Personal Assistants Apple’s Siri and Amazon’s Alexa and Echo bypass typing to speak directly to your Bot and let it do the work. Chatterbots: talkbot, chatbot, Bot, chatterbox. Artificial Conversational Entity is a computer program which conducts a conversation via auditory or textual methods. IBM’s Watson is chatterbot royalty. AI as a Service (AIaaS) ‘Middleware’ intermediaries customize the link between any business and the world’s most sophisticated AI platforms, like Amazon’s Web Services. In so doing, they tap into both Big Data and the processing power that they contain.